Jesus reminds his hearers that not only did he promise the Spirit, but so did his Father. John the Baptist also prophesied regarding the sending of the Spirit. Jesus thus relates the prophetic utterances of 2 prophets: himself and John the Baptist. But this is not a one-time event! It is the active movement of the Spirit in the ongoing life of the church. (Birmingham, W&W, p. 321) How is Spirit active in our church? How is Spirit active in YOU? Reflect on the experience of the disciples after the death of Jesus. Imagine what it would have been like to have followed Jesus, lived with him, eaten with him, and now he was gone. He is not physically here anymore. How does that make you feel? What are you going to do now? There is concern in verse 6 over God’s intention for the salvation of Israel. Where was Israel’s place in what God was doing in Christ? There is hope that Christ will deliver Israel, but there is also concern and question. Hope is not dead in spite of Israel’s rejection of Jesus. Acts highlights the drama of a people turning away from the messianic fulfillment that was theirs for the taking. However, this rejection is still fraught with the future hope of restoration. All is not lost for Israel (Birmingham, W&W, p. 322). There is a feeling like the disciples want everything to be fixed FOR them. The ‘men dressed in white garments’ asked why they were looking up. In the movie Evan Almighty, Morgan Freeman who plays God, asks the same question. He says that is our problem: everyone is always looking up. Can you think of times when you looked up, rather than involved yourself in the solution? A Spirit of Wisdom (Sophia, wisdom of the deep things of God): To be a thinking people. Plato said, “The unexamined life is the life not worth living.” A questioning faith is a healthy one! For fuller revelation and fuller knowledge: Our spiritual life is like a muscle. It must be exercised regularly. Just like any friendship, it takes effort. New realization of the Christian hope: isn’t this what the disciples are faced with in the Ascension? New realization in the power of God: Because of the resurrection, God’s purpose cannot be stopped by any action of men (or women). In a world which looks chaotic, it is well to realize that God is still in control. We are the body of Christ. There is a legend that the angel Gabriel asks Jesus after the Ascension what will happen if the disciples grow tired and don’t spread the good news. “What if the people who come after them forget? What is away down in the twentieth century people just don’t tell others about you? Haven’t you made any other plans?” And Jesus answered: “I haven’t made any other plans. I’m counting on them.” To say that the Church is the Body means that Jesus is counting on us. They doubted. The doubt reminds us that, even after the resurrection, faith is not an automatic response. But Jesus is not repelled by their doubt, for he now comes closer to the disciples to speak. Doubting or not, they have worshipped him, and he responds to them. The mission is entrusted to the Eleven, even though some doubted. We are left to suspect that the word of Jesus solved the doubt, and that by proclaiming to others, their faith was strengthened. Does this resolve your doubts too? “Make disciples of all nations” The apostles cannot simply wait for the Gentiles to come; they must go out to them. And if in the ministry the chief Jewish followers of Jesus (the Twelve) were called disciples, that privilege and title is to be extended to all nations (and you!). Recall Deacon Ron’s homily last Sunday. Spirit is our spiritual GPS. We must only believe and trust in Spirit to show us the way, or re-calculate when we stray! When does God dwell among us? The gospel says it is when we love, keep Jesus’ word, and believe. Rather than three different tasks, these are really three descriptions of the same action – giving of one’s self – a self-sacrifice that leads to life. And, what does God bring when God dwells among us? God brings us his Holy Spirit, the Advocate, to enlighten us, to empower us, to put our troubled, fearful hearts at work and at peace. The word, “Advocate,” is sometimes translated “paraclete,” “counselor” or “comforter” – the Greek word basically means “advocate,” a legal term that is for the “one who stands by the side of a defendant.” From its use in the gospel it seems that it has three functions or activities. 2) It is a truth-telling Spirit (14:17; 16:13) assuring us that Jesus is not a shameful failure, but the beloved of God. 3) It reminds them of things that Jesus said (14:26) and reveals things Jesus was unable to convey (16: 12-14). In other words, this Advocate represents divine presence and guidance. It is all we need! Hellenists were congregations of Diaspora Jews (those who had lived outside the Holy Land) but returned to Jerusalem. They were more open to new ideas and less rigid in regard to ritual law than their fellow Jews. Because of this, they were despised and persecuted by the non-Christian Jews, and were eventually driven out of Jerusalem. It was providential because it ended up spreading the new faith (Church History, J. Dwyer. P. 25-27). St. Stephen is the patron saint of deacons. This is one of the primary roles of deacons to bring alms to the widows. The apostles are beginning to organize themselves. The laying on of hands suggests the idea of being called into formal service. The apostles listened to the needs of the people and responded. How do our deacons do this today? It is likely that this reading is taken from an early homily, perhaps given as instruction for candidates for baptism (W&W, Birmingham, p.308). This reading calls us. How does it call you? The early Christians did not ‘build’ a church until the 4th century; they met in homes and, at times, catacombs – What can we learn from their idea of church? What does each mean for you? How does each move us from darkness into God’s light? Christians, the living stones, are joined by Christ himself who is the cornerstone – the foundation that supports the living stones. In the Old Testament no one was to approach the rock of Sinai, under penalty of death. Contrast that with Jesus, the cornerstone, who invites his people to come close to him. He has created something new and wonderful. He has gathered his living stones and formed them into a new people, a new religion (W&W, Birminham, p. 308). Remember, these words come before the crucifixion in John’s gospel. Yet, they are truly a life-giving Easter message. “Do not let your hearts be troubled” – Jesus’ opening words for this Sunday – what meaning do they have for you? The Greek word, mone, that is used for ‘dwelling places’ means a place of abiding rest, a haven, an inn of security – sometimes it has been translated, ‘mansion’ –What do you think best fits what Jesus is saying here? grows, creates, loves . . .
“It would be nice to reduce reality to a simple statement. But existence is as untangleable as a snarled fishing line. There is no secret word, no magic potion, no hidden wisdom. If there were, Jesus would surely have found it. We must learn to read the truth between the lies. Jesus is not the Solution; He is the Way. And the best he can give us is some direction along the way. “cut, or pierced to the heart.” This is what repentance or conversion is all about. Peter’s message was urgent. Repentance was not understood just as the turning away from a laundry list of sins. For Peter’s crowd it meant a radical reassessment of who Jesus was really was-what his significance was (W&W, Birmingham, p. 300). Who is Jesus to you? Right now? Remember that Jesus’ wounds became his identification marks after resurrection. As ‘wounded healers’, we can let the Spirit of Jesus help us to bring life out of the good and the bad times of our lives. This letter is written to a people –many of whom were slaves — who were being persecuted for their faith under the Roman Emperor Domitian at the end of the first century. Their endurance in the face of suffering helped the church to survive even to this day. May we trust in this same Spirit when we face difficulties. (Celebration, April 2005). How do you think we are ‘healed’ by the wounds of Christ? “Happy are they who have reached the end of the road we seek to tread, who are astonished to discover the by no means self-evident truth that grace is costly just because it is the grace of God in Jesus Christ. Happy are the simple followers of Jesus Christ who have been overcome by his grace, and are able to sing the praises of the all-sufficient grace of Christ with humbleness of heart. Happy are they who, knowing that grace, can live in the world without being of it, who, by following Jesus Christ, are so assured of their heavenly citizenship that they are truly free to live their lives in the world. Happy are they who know that discipleship simply means the life which springs from grace, and that grace simply means discipleship. For them the word grace has proved a fount of mercy,” (Bonhoeffer, The Cost of Discipleship, p. 60). Ezekiel 34+: “Son of man, prophesy against the shepherds of Israel . . . who have been pasturing themselves! Should not shepherds, rather, pasture sheep? . . . I am coming against these shepherds . . . I will save my sheep . . . 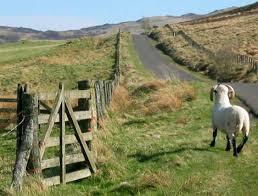 I myself will look after and tend my sheep . . . The lost I will seek out, the strayed I will bring back, the injured I will bind up, the sick I will heal [but the sleek and strong I will destroy], shepherding them rightly. Jeremiah 23+: “Woe to the shepherds who mislead and scatter . . . I myself will gather the remnant of my flock . . . and bring them back to their meadow . . . so that they need no longer fear and tremble; and none will be missing, says the Lord. Psalm 23: “The Lord is my shepherd” . . . In the morning when it was time to take the sheep to pasture, the shepherds would call to their sheep by a special sound or whistle, laugh or strange type of noise or song. Each sheep recognized the voice of their own shepherd. They followed that voice for it meant food, protection, warmth, healing and safety. This sleepless, far-sighted, weather-beaten, armed shepherd was the source of life and protection, strength and guidance for the sheep. (Celebration, April 1999 & 2005, as well as John Pilch, http://liturgy.slu.edu/4EasterA041308/theword_cultural.html). In today’s world we encounter many gates. There are gated communities, gates of entry into theaters and sporting events, toll gates. Each gate represents both a dividing line and a means of entry. What does Jesus divide? What does Jesus open up? In John’s gospel, there is a series of solemn statements that identifies aspects of Jesus’ identity. These are called the “I am” statements, such as “I am . . . the bread of life (6:48); the Good Shepherd (10:11, 14), the way, the truth, and the life (14:6), the light of the world (8:12; 9:5), the resurrection and the life (11:25). In this week’s gospel, Jesus asserts, “I am the gate” (10:7, 9). This gate opens up to abundant life . . .
Pray about which image seems most meaningful to you. 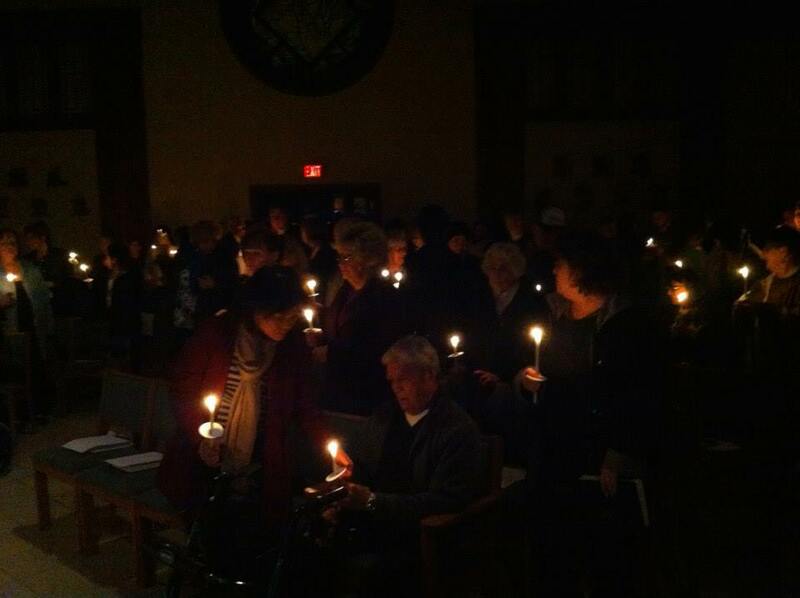 This picture was taken at our recent Easter Vigil. The paschal candle was lit by the Easter fire outside and brought to each person. The flame represents the presence of the Risen Christ. Each of us receives it so we may all be “enlightened”. And now, the paschal candle remains lit throughout the Easter season as a reminder to us. This picture really strikes me as who we are as church. We all have the light of Christ within us, and together we can light up the world. But lately, I don’t feel so lit up. Thinking back on the last week for our parish: It. has. been. hard. So much having to live in not knowing and needing to be in the tension of that. I feel like I’m supposed to be OK with it all. I am not OK! Not knowing and having to wait for things out of my control are not easy for me. I don’t want to be OK with it. You know what I do want? Company. I want to hold hand-in-hand with my God and our parish and sit together in the discomfort. Hold vigil. This is what we did on Holy Saturday. We gathered around the flame…the Easter flame…and we are still doing this now. Coming to church and gathering around the flame, like a campfire, is what is comforting and healing right now. The awesomeness of the Easter Vigil is that we wait, but in hope! Despite any odds and unknowing, Jesus lives! Good news still happens! What causes death (to life, to hope, to love) never has the final answer. Jesus sees us through the cross. We hold vigil knowing there will be light again. We don’t have to have that peaceful, touchy-feely feeling. Spirit comes in our moments of wacky unknowing and keeps us company. We can wait in hope despite the answers. Because we have a God who broke through history and chose to dwell among us, even after death. So I take it back. I do feel lit up. Because God is with me. Because God is with us. And the flame will never go out.